In November, Donald Trump could be President of the United States of America. Alexis Tsipras is the Prime Minster of Greece. In Spain, Podemos, an insurgent left-wing party founded in March 2014, is the third largest Parliamentary party. In France, the far-right National Front notched its best result ever in last year’s regional elections. Podemos could take power as part of a left-wing coalition in a general election later this month; Marine Le Pen will be in contention for the Presidency in 2017. In Scotland, the Scottish National Party (SNP) retained power for a third consecutive term, the Conservatives are the second largest party and a referendum on independence took place a few years ago. In the most recent UK General Election, the Liberal Democrats won just eight seats, the SNP took all but three available in Scotland and the Conservatives formed a minority government. Jeremy Corbyn, the rebel backbencher for Islington North, is now Leader of the Labour Party. Across the Western world, post-war political structures are facing their toughest challenges yet. New parties and personalities are taking advantage of communities fractured by globalisation and voters, especially the young, are disillusioned with leaders. If you had put a tenner on any of the above coming true a few years ago you’d now be feeling pretty smug. If you’d done so as a political commentator, you would probably be held as the Mystic Meg of politics and appear on a sofa next to Andrew Neil or a breakfast table with Robert Peston. Indeed they are, Mr Dylan. Indeed, times always change and bring new challenges. But new challenges offer new opportunities, opportunities to do things differently, even better than before. Change is inevitable, never despair and look for the good: this should be the constant mantra of modern progressives. Bruce Nixon understands this. As he says in the opening pages The 21st Century Revolution – A Call to Greatness, ‘the challenges are enormous, but so are the opportunities’. In his book, he takes the courageous decision to do both, proving not only a discussion on what has gone wrong but also solutions to create a better future. It’s to his credit that he does this: anyone with Internet connection can do the former, not everyone can do the latter. For Bruce, today’s giant evils take the form of climate chaos, poverty, growing inequality, as well as the structure of our political system and the inadequate results of decades of neoliberalism. 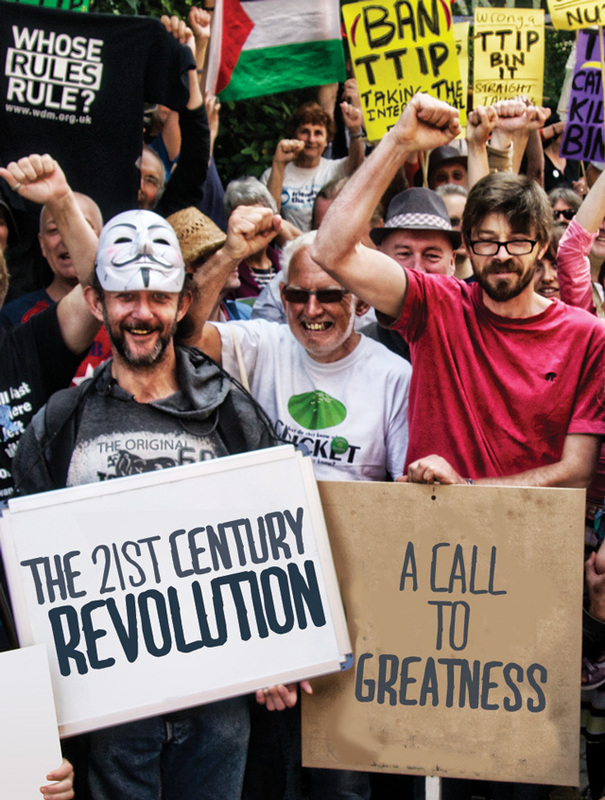 Our current power structures have for too long failed to tackle the big issues and are therefore not fit to take us on the journey our we and planet need for the 21st century. At the core of his diagnosis lie the weakness of our approach to problem solving and the noticeable lack of visionary leadership. As he states, for too long we have suffered a ‘system based on short-term self interest rather than generosity of spirit…we need a vision that that uplifts and engages people in a great, new endeavour that creates a prosperous society in which everyone benefits’. Recent political campaigns littered with fear and pessimism proves him right. In its place, Bruce puts forward the notion of a ‘systems thinking’ approach to problem solving. As a society, we shirk the challenges of today with solutions fit for tomorrow, or, if we’re lucky next week, with little thought for future generations. Housing, health, environment, welfare are all areas where we need to plan for the future and think beyond the needs of voters in the next election, a tough challenge given our current political structures. To resolve this, Bruce calls for the transformation of democracy and a new social contract between the state and its citizens. As he argues, taking inspiration from Finland, where a Parliamentary Committee has been created to think about the impact of policy on future generations, would be a good start. However, this is only part of the solution. As he rightly points out, we have for too long lacked positive and visionary leadership. Such an environment is fertile ground for populism resulting in the rise of the Trumps and Le Pens. On the other side, the rise of Podemos, Syriza and Corbyn point to a more progressive future, but we need to look towards building their successors, nurturing what will grow out of their breakthroughs. Indeed, in the US, one could argue that the Sanders movement grew from the breakthrough of Obama. The next wave could be something truly reforming and truly special. Don’t give up hope. In the second half of his book, Bruce provides an encyclopedia of ideas to create a new economy and a polis for a better future. Touching on environmental and economic solutions, calling for peace and the transformation of democracy, he provides an invaluable toolkit for those looking for alternatives. The fact that the majority of his proposed solutions have at least a campaign behind them, if not actually working in some part of the world, balances out the doom and gloom of the book’s opening and provides hope that we can meet the challenges of today in a ‘systems thinking’ approach that combines both bottom-up and top-down measures. It would be wrong of me to say I agree with every proposal but nonetheless I applaud their undeniable intention to change the world for better. My constant criticism of books like this one is that they preach to the converted, appealing only to already on the left or involved in the new economy. If we are to achieve in a successful revolution like the one Bruce calls for then we must reach out beyond the usual crowd and start changing minds. For this reason, I question the impact this book will have in accelerating the called for revolution. However, my criticism should not take anything away from the positive and much needed message Bruce puts forward. He is right to stress that we, the people, are the heart of the revolution and if ‘we want a better world we first need to transform ourselves’, perhaps the hardest thing of all. It is without doubt a much-welcomed call for us to take control over our destiny and create a better world for our children and their families. As he says, there are seven billion of us; we have far greater power if we use it. This is our time of change. We must ensure we don’t waste it. It’s books like Bruce Nixon’s that go someway to make sure we won’t.